A couple of weeks ago I outlined a wasted trip to the ballpark due to the Rockies waiting until the last minute to postpone a game due to rain. Since then, numerous teams have been guilty of exactly the same thing: gouging their customers for beer and parking for an hour or two before deciding to call the game. Today however, I applaud the Minnesota Twins for doing the right thing. A few minutes ago, the Twins postponed tonight’s game against Tampa Bay even though it is not scheduled to start for another five hours. This will give fans plenty of notice before they waste gas driving to Target Field, and it also means they won’t be out a parking fee for no reason. I hope that other MLB teams follow suit when it is obvious that inclement weather is going to get in the way. Minnesota Twins organization, you receive a tip of the cap for your sound decision making. Does Miami know they have a baseball team? 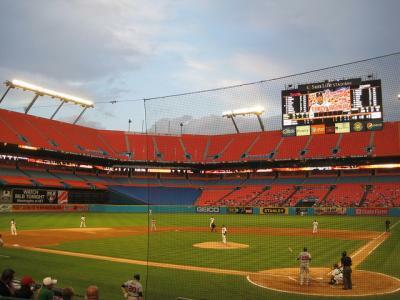 Luckily for the Marlins they are opening a new retractable roof stadium in 2012. Maybe that will inject some enthusiasm into South Florida. If it doesn’t, it’s fair to wonder whether Miami even deserves the Marlins franchise. So far in the early going of the baseball season, I have noticed a not so subtle theme to the ESPN baseball broadcast schedule. As usual, it is heavy on Yankees and Red Sox and no one else. Sure, the defending champion Giants got some love in the first Sunday night broadcast of the year, but by and large ESPN is once again operating under the assumption that the Yankees and Red Sox are the only two teams in the league. In doing so they continue to ignore many other teams that are worthy of attention. While there are several teams that deserve more national attention this year (Cleveland and Kansas City have two of MLB’s top five records and even die hard fans can’t name their players), I’m going to put on my hometown hat and bat for the Rockies. In five years the Rockies have appeared on ESPN exactly one time, and that was when they were in town to play one of the network’s beloved east coast teams, the Mets. Their playoff appearances in the past five years are double the number of times they’ve been on ESPN. The Rockies have the best record in Major League Baseball as of this writing, and yet are not scheduled for a single appearance on the mother ship this season. In Colorado’s case it’s not limited to ESPN. When the Rockies made the World Series in 2007, TBS announcers butchered the pronunciation of Troy Tulowitzki’s name more than once. Perhaps it’s not a coincidence that the Rox had not been on any national network during the 2007 season. Thus, the announcers were completely unfamiliar with the team when they made the playoffs. While it was comical to watch them fall over themselves and laugh at their clear lack of preparation, it illustrated just how much the national networks don’t care about smaller market teams like the Rockies. Speaking of Tulowitzki, I am convinced he would be of America’s most popular players if he played in New York or Boston. Because he plays in Colorado, many national pundits don’t appreciate how good he is. When the Rockies re-signed him this offseason to the tune of seven years and $134 million, many national “experts” scoffed at it. They claimed the Rockies wasted money foolishly on a player who is not among the elite. Well, so far this season Tulo is hitting .343 with seven home runs. Albert Pujols has five. Tulo also makes a highlight reel play seemingly every night and is the consummate team leader. I think had Tulowitzki signed that same contract with the Red Sox, it would have been lauded as a great signing by the ESPN folk, but because it’s Colorado they don’t care. This also has an effect on national fans. An ESPN.com poll asked fans whether the Rockies were smart or foolish in their decisions to re-sign Tulowitzki and Carlos Gonzalez. While this seemed like a clear no brainer to me to keep two of MLB’s ten most talented players, more than 60 percent of fans nationally thought the Rockies were making bad decisions to give these young players so much money. I think if these players were on the east coast, national fans would have a much better idea of who Tulo and Cargo are because they would be on ESPN much more often. Because the Rockies are never on, even big baseball fans in other markets aren’t familiar with what these players can do. I think the national attitude toward the Rockies can best be summed up by an article in a New York newspaper that suggested the Mets could get well against the “weak Rockies” during a four game series last week at Citi Field. The article suggested that the Mets would have easy pickings against Colorado. While this may have true for many years when the Rockies were struggling, times have certainly changed for this franchise in the past five years. The Rockies ended up sweeping the four game series against the Mets in rather emphatic fashion, so perhaps if the Rockies can continue their high level of play they might finally get the respect they deserve. Than again, I’m sure ESPN will treat us to 15 more Yankees games before they decide to grace the Rockies with an appearance. Rainout? Doesn’t matter to the team! So my dad and I had tickets for today’s game at Coors Field between the Colorado Rockies and Arizona Diamondbacks. It was 84 degrees yesterday, so tickets to a Sunday afternoon game seemed like a no brainer right? Wrong. The bad weather moved in faster than an Albert Pujols batting practice shot. When we went to breakfast it was 60 degrees and sunny. By the time we got to the ballpark four hours later it was in the 40s and dropping rapidly, not to mention it started snowing. We were pretty sure there wasn’t going to be a ballgame but here we were driving down to the stadium anyway. Despite the clear bad weather, the parking attendants were happily taking money from people. When we got inside the stadium, the restaurants and concession lines were all packed, not to mention the team store, which was so crowded you couldn’t move without elbowing someone. Meanwhile, while the money was flowing courtesy of all the unfortunate fans who were packed to the gilds on the concourses because they did want to sit in their seats in the pouring rain. After all, we all know how exciting a baseball field is when it’s covered up by a tarp. The snow was falling harder by the minute. There was nothing on the scoreboard except the logos of the two teams. No announcements, no mentions of when or if the game might start. The other scores around the league were still being updated out in right field, which seemed very bizarre because no one was in the seats to see that. We broke down and decided to get hot dogs ourselves. I checked my phone to see if I could get a weather update that way, and when I popped up my scoreboard app, all it said for our game is “delay – top 1st” which was a bad sign considering first pitch was still 20 minutes away. 1:10 came and went, and still no update. Now, we were fortunate to have tickets and a parking pass that we didn’t have to pay for, but for most of the other fans today was money down the drain without any real return on it, save for a buzz or maybe a sweatshirt. Most of the fans in attendance had plopped down $13 for parking. Many had spent more money on beer, soda, hot dogs and other food. Worst yet perhaps was that most fans had paid pretty good money for seats. Let’s say a family of four bought upper deck seats. That’s $100 right there. Plus you add in the drive down to the stadium at inflated gas prices and you get the idea. Sure, fans can use their tickets for the rescheduled game, but that means another parking fee, more concessions and more gas. Plus another program perhaps. Not to mention, the rescheduled game will not be on a Sunday afternoon. It will be during the week because the two remaining visits to Denver by the Diamondbacks are during the week. If fans are lucky, it will be on May 23rd, which is a Monday and a common off day for both teams. Otherwise, it could well be part of a midweek day night doubleheader, which means an afternoon game during the week. Either way, fans will not be getting what they thought they were buying, and in many cases will not be able to make the rescheduled game and will thus eat the money for their tickets anyway. I do not mean to imply that rainouts shouldn’t happen. They will always be a part of baseball and are inevitable. I certainly do not think it would have been wise to play game in those conditions. However, anyone with half a brain could have looked at the weather forecast, which was guaranteed to be lousy, and postponed the game well in advance. Everyone knew precipitation was coming in at some point during the day. It would have made sense to postpone the game early in the morning, get the word out through radio and social media, and save everyone the trouble and hassle of driving downtown for nothing. It would have been fair to the fans to postpone the game with enough notice once it became clear it was not going to be played (it was clear to me two hours before first pitch, and I’m not the one with access to all the weather data they have). It is obvious to me that the reason they waited until after the game’s scheduled start to make any kind of announcement was money. Remember there was no in stadium announcement whatsoever until the postponement. By waiting several hours to reveal any information, the Rockies pocketed who knows how much money in parking fees, concessions and merchandise. I even saw several poor souls buying tickets at the window outside the stadium as we walked in (a good hour before the announcement of the postponement). To be fair, fans at this point could have used their head and not bought tickets. On the other hand, they probably headed to the ballpark much earlier, maybe even had called the team to find out if the game would be played. In any case, by waiting mere hours to postpone the game, the Rockies made a ton of money for themselves at the expense of their fans, many of whom are struggling to make ends meet in this poor economy. To me, being able to use the ticket for the rescheduled game is a nice and very fair gesture, but many fans will not be able to take advantage of that. Besides, they will once again have to pay for parking and many will likely buy concessions again. For us, this was a trip to the ballpark for an expensive hot dog. For many others, it was a planned family outing that certainly didn’t live up to the billing, and caused a hit to the wallet without any benefit in return. Next time the weather is very clearly ugly, I hope the Rockies and other MLB teams keep their fans in mind and give them the courtesy they deserve. Make an effort to decide one way or the other whether a game will be played in a timely manner. If you’re more than 50 percent sure it won’t be played, call it. Don’t wait until you’ve gouged your customers. Going to a game these days is expensive as it is. Don’t force your fans into paying added expenses for no reason.